Mount Everest guides cancel season after avalanche. 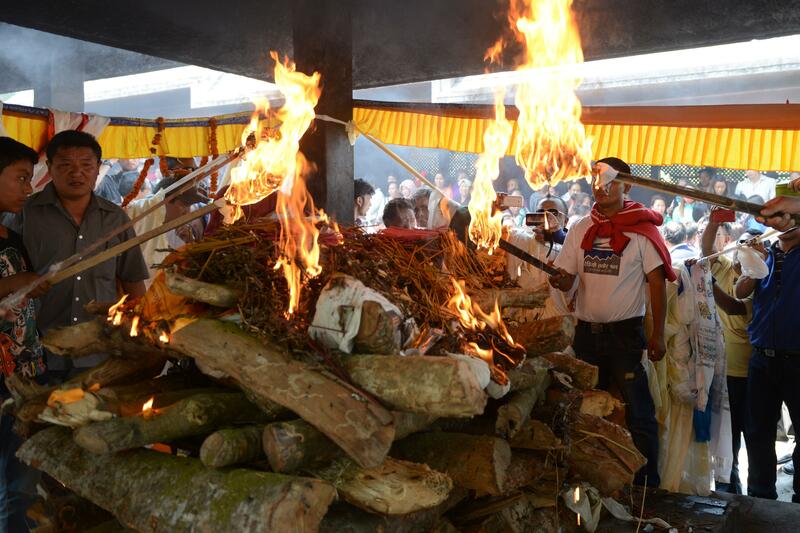 A funeral pyre for one of the victims of the Everest avalanche. After 13 of them died (with three more missing and presumed dead) in last week’s avalanche, Mount Everest’s “sherpa” climbing guides will leave the mountain and shut down the 2014 climbing season before summit attempts have even begun, AFP reports. “We had a long meeting this afternoon and we decided to stop our climbing this year to honour our fallen brothers. All sherpas are united in this,” local guide Tulsi Gurung told AFP from base camp. “Some guides have already left and others will take about a week to pack up everything and go,” said Gurung, whose brother is among those missing after an avalanche last Friday killed 13 sherpas and left three missing and presumed dead. Per the article, 32 expeditions had been issued permits for Everest climbs this season by the government of Nepal. It’s also possible to ascend the mountain from the northern Tibet side; the AFP article doesn’t make clear whether these ascents will be affected by the decision, but sherpas (lowercase sherpa = mountain guide, uppercase Sherpa = member of Sherpa ethnic group) also work the northern route. In 1996, for example, I made four round trips through the Khumbu Icefall: three circuits as I progressively acclimatized to twenty-four thousand feet during the month of April, and a final round trip on my journey to the 29,035-foot summit and back. I was terrified each of the eight times I moved through the frozen chaos, which usually took more than three hours to ascend, even with my nearly empty backpack, and slightly less than an hour to descend. In contrast, each of the sherpas supporting my team’s ascent was required to make something like thirty trips through the Icefall, often while carrying eighty-pound loads of food, propane, and bottled oxygen.